Looking to create a polished and refined modern kitchen space in your home? 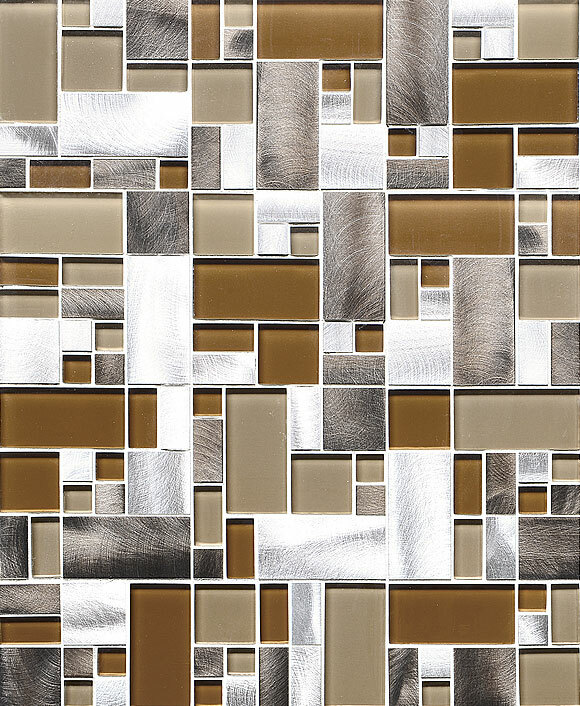 Keep your color scheme classic with this modern glass metal backsplash tile, perfect for a stunning kitchen backsplash. The clean lines and simple structure of the pattern are ideal for radiating the sleek ambiance desired in a modern design. 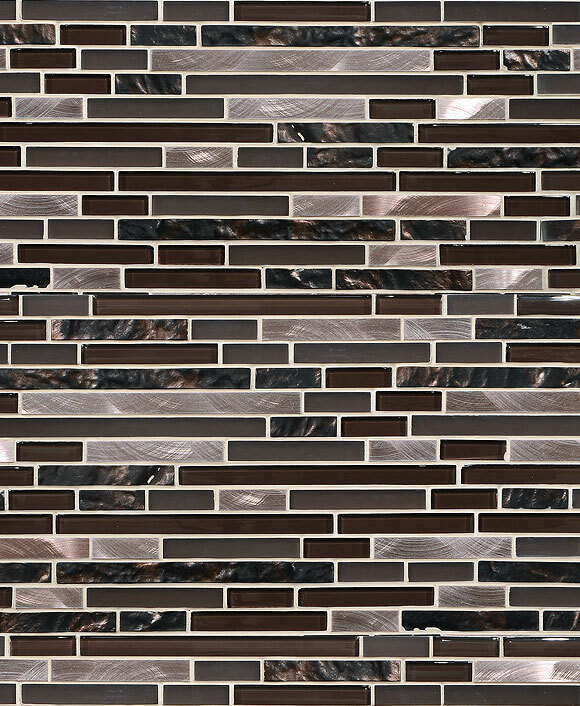 The movement of the pattern within the tile captures your attention and becomes a one-of-a-kind kitchen backsplash that will be both sophisticated and fun. Not to mention, this tile is naturally easy to maintain and resistant to staining, perfect elements for a white backsplash. Let the bright whites and shining silvers pop when paired with simple black, gray or white cabinetry. In keeping with modern design elements, opt for a simply structured cabinet, like the shaker style seen in this kitchen. Black cabinets are perfect for homes with lots of bright lighting available, whether natural or artificial. They are both bold and classic, a beautifully modern statement to make in your home. If you opt for black cabinets, complement the white glass metal backsplash tile in your backsplash with a simple and clean white granite countertop or quartz countertop. A marble countertop would also work wonderfully to complement the glass metal backsplash tiles scattered throughout this mosaic tile pattern. Get more ideas about glass tile backsplash. Alternatively, you could also let your kitchen gleam by pairing the modern glass metal backsplash tile with white cabinets for a clean and airy look, certain to brighten up your home in a heartbeat. White cabinets would allow you to select a darker countertop to contrast the tile, like the black galaxy granite countertop to highlight the shining elements of your backsplash or an absolute black granite countertop to provide a simple but stark contrast. Either way, your kitchen will have a very polished and sophisticated modern feel. Avoid overwhelming your kitchen space with too much black and white by opting for shining stainless steel appliances to match the metal inserts in the modern glass metal backsplash tile. The stainless steel keeps the color scheme cohesive while providing a different element that allows your backsplash to become a beautiful focal point. Hardware on cabinets should also be sleek and polished silver, as well as any additional elements like towel rings or canisters. Modern design loves simple color schemes with lots of movement but without an overwhelming amount of color. Adding to a mixture of other metals makes your space feel more modern. Modern designs typically highlight the beauty of natural items, so allow fun pops of accent colors to come from things found in nature. A bowl of fresh citrus fruits or a few small plants can adorn the counters to grab your attention and liven up an otherwise monochromatic and simple design. Transform your kitchen into a modern space straight from a home decor magazine with these tips and tricks for incorporating a modern metal glass backsplash into your kitchen designs. 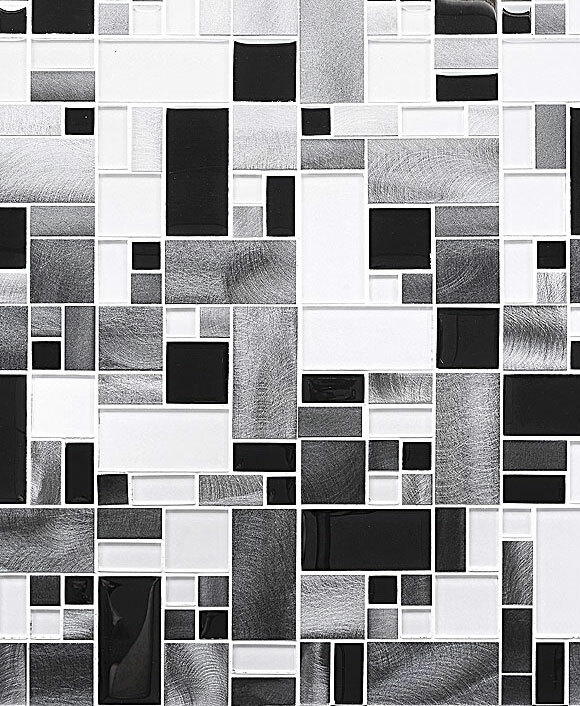 Whether you want your space to feel dark yet elegant or bright and sophisticated, this modern glass metal backsplash tile will lend you just the right touch of refined modernity to make your space feel fresh and contemporary. This entry was posted in GLASS, GLOSSY, METAL, MODERN, MOSAIC. Bookmark the permalink.